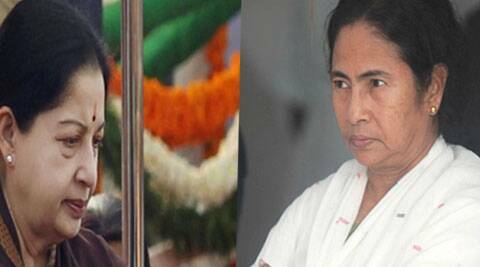 Jaya was learnt to have invited Mamata to a post-poll dialogue. The leaders apparently agreed that their parties could work towards building a common platform. A day after Mamata Banerjee said on television that she was willing to accept Jayalalithaa as Prime Minister, the AIADMK supremo rang the Trinamool chief at her office at the West Bengal secretariat. Sources said the two chief ministers spoke for several minutes, and agreed that in their mutual interest, they should take decisions jointly after the election results were known. Jaya was learnt to have invited Mamata to a post-poll dialogue. The leaders apparently agreed that their parties could work towards building a common platform. A source in the Bengal CMO said Mamata underlined the importance of regional parties, and her strong belief that they would have the final say in the formation of the next government in Delhi. Jaya’s call came the day after the AIADMK and Left broke their understanding in Tamil Nadu over the sharing of seats. Former CPM MP Md Selim described the development as “unfortunate”, and said the Left had no “post-paid” schemes to offer — referring to Mamata’s statement last month that this was the age of “post-paid, not pre-paid”, and that she was open to exploring alliances. Selim, who is the CPM’s candidate from Raigunj in North Bengal, said “power brokers” had become active as soon as the 11-party third front was forged on the basis of definite action plans and issues. “This front is not like other political entities who are non-committal on critical issues, and can swing either way at any stage,” he said. Mamata on Friday met her party’s nominees at her home in Kalighat, where the contestants — many of whom are political greenhorns — were taught how to go about the campaign. The candidates were instructed to remain non-committal on supporting either the UPA or the NDA, sources said. The candidates were told that the elections would throw up new political equations, and the Trinamool would play a key role — they must, therefore, work hard to ensure as many seats as possible for the party. Mamata was learnt to have rejected complaints about the party fielding many “non-political faces”, ignoring local demands. Humayan Kabir, who switched to the Trinamool from Congress strongman Adhir Chowdhury’s camp in Murshidabad, apparently said that he would have to think of “alternatives” if he did not get “proper respect”.